Over the last two years, I’ve reviewed in detail more than a hundred (actually approaching two hundred) personal finance and personal productivity books on The Simple Dollar – for more than a year, I reviewed two a week. Over that time, many readers have asked me what I’m doing with all of those books. Some came from the library, a few were review copies, and some were gifts, but surely I had to be building up quite a library, right? Not quite. Here’s my bookshelf of books I’ve bought and kept because of The Simple Dollar. That’s right. Eight books. These were the only eight that were interesting enough and reference-worthy enough for me to keep around – the rest were either checked out from the library or given away. 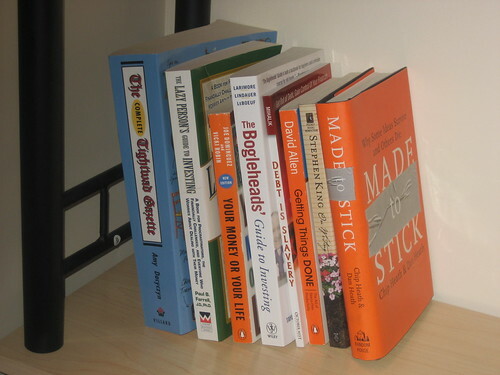 In my eyes, out of all of the personal finance and personal productivity books I’ve read and reviewed on this site, these were the eight worth keeping. Everything else? Given away. Taken back to the library and forgotten. Traded. In some way, they all bit the dust. This is a thousand-page tome of short articles on specific frugality topics. Not only is the book a frugal inspiration, the author is also a personal and professional inspiration to me. You can’t tell from the picture, but it’s pretty dog-eared and has a foul-looking stain on the lower right hand corner. This book is the “survivor” on this shelf. I kept thinking about tossing it, but every time I open it, I’m inspired deeply to think about investing and I wind up leafing through it for an hour thinking about portfolios. It makes investing more fun than any book I’ve ever read – by far. This is the book that inspired my financial turnaround and has inspired more posts on The Simple Dollar than any other. My copy is disturbingly dog-eared from being read through so many times, and I still turn to it all the time for inspiration for staying on the right financial track. This is the investing reference book on my shelf. It’s extremely heavy on facts without being a burden to read and the philosophy of the writers matches my investment philosophy perfectly. It’s the one book on investment advice I trust above all others and is my final answer when I have questions. Like a Cliff’s Notes version of Your Money or Your Life – much the same content, but very short and with a different tone. This lately has become an inspiration, too – I can pop it open and get inspired by just reading a random paragraph. This is the book that taught me how to manage my time effectively enough to build The Simple Dollar while writing a book, maintaining a full time job, and having time at home with a toddler and an infant girl. Allen’s principles are a constant inspiration and this book is incredibly dog-eared and messy because it’s full of hand-scribbled notes. This is the single book that inspired me to change my career and become a writer. Whenever it’s tough for me, I turn to this book – I’ll curl up and read it and not feel alone in the challenge of writing. It seems to magically refill my batteries and make me feel motivated to pick up the pen again. This is my “idea factory” book. Whenever I’m having trouble developing ideas or coming up with unique ones, I open this book, read a chapter, and work through what they’re saying. Almost always, good ideas develop and I work from there. What about other books you’ve reviewed? Are they all bad? Not at all. Many are quite good. To me, though, many books are good or are even quite good, but it takes a little more to be great. It has to stick in my head for a long time. It has to make me keep going back to it for reference and for refreshment. It has to simultaneously inform me and entertain me. It has to leave me feeling that my time was really valuable each time I sit down and read it. Only these eight books made that cut for me. I’ve read many books that I think could make that same cut for others and I often recommend them, but these are the ones I turn to time and time again. What personal finance and personal development books do you consider essential enough to own your own copy for reference?